Licitars are colorfully decorated biscuits made of sweet honey/gingerbread dough that are part of Croatia's cultural heritage and a traditional symbol of Zagreb. They are used as an ornamental gift often given at celebrations of love such as weddings, St. Valentine's Day, birthdays. At Christmas time Zagreb is adorned with thousands of licitar hearts; the Christmas tree in the main square is festooned with thousands of licitar hearts. In 2010, UNESCO added the Gingerbread craft from Northern Croatia to the "Representative List of the Intangible Cultural Heritage" for Croatian culture. The tradition of making and giving Licitars is very old, stretching as far back as the 14th Century. Licitar makers, known as Medičari, were highly regarded in society, and their Licitars very much sought after (licitars were more sentimental than giving a bouquet of roses). Even today the tradition is kept alive by a select few who covert the art in family secrecy, and their methods of production have scarcely changed. 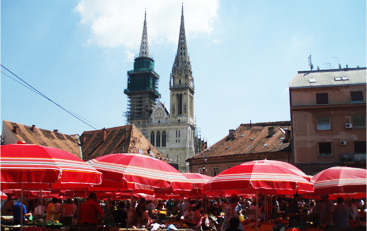 Licitars became famous due to their being sold at the Marian shrine of Marija Bistrica (near Zagreb) to which pilgrims visited St Mary of Bistrica for the Assumption or St Margaret's Day. Although not a religious symbol, licitars were often bought to take home as a reminder of their long and sometimes arduous journey to Zagorje. Licitars' simple shape and attractive colour and decorations were a keen souvenir to show their families and neighbours on their return. Licitars are made using traditional ingredients, methods and devotion. Their ingredients are simple (honey, flour, eggs, water and natural colours) but their preparation is long. The dough matures for a few days, then is shaped and baked and left for two weeks to dry. Colouring is the next step after which they are left to dry again for two weeks. Once dry the licitars are finally decorated and again left to dry for a week. Traditionally Licitars are 100% handmade, decorated with a swirling outline, small flowers and a small mirror. Being made of honey dough and natural products Licitars are also edible. In modern times Licitars are traditional Croatian souvenirs (and can be found in all Croatian airports and in many tourist gift shops), Christmas tree decorations, wedding favours for guests, business gifts, many other ornamental purposes, and is still given as a way of showing your affection to the ones you love.